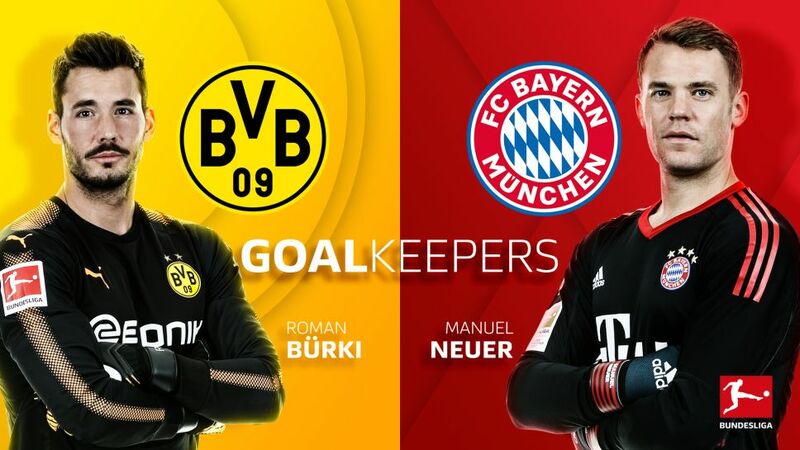 Bundesliga | Borussia Dortmund vs. Bayern Munich: Vote for YOUR Klassiker dream team goalkeeper! Borussia Dortmund vs. Bayern Munich: Vote for YOUR Klassiker dream team goalkeeper! Ahead of the first Bundesliga Klassiker of the season, bundesliga.com is giving you the chance to vote for your Bayern Munich-Borussia Dortmund dream team. All 11 positions are up for grabs, and it's your votes that will determine the final combined Bayern-Dortmund XI, which we will present to you ahead of Saturday's big match. Here we present to you the four candidates for the goalkeeping position: Roman Bürki, Manuel Neuer, Sven Ulreich and Roman Weidenfeller. Cast your votes in the poll below! Vote for your combined XI below! Switzerland international Bürki made a remarkable start to the 2017/18 campaign, keeping five consecutive clean sheets as Dortmund swept to the top of the table with four wins and a draw. The 26-year-old may not possess the same aura as Manuel Neuer, but he boasts similar shot-stopping prowess and has established himself as one of the top goalkeepers in the Bundesliga, impressing with Freiburg in 2014/15 before replacing Roman Weidenfeller as BVB's first-choice keeper in 2015/16. Bürki is now looking to add a first Bundesliga title to the DFB Cup he helped Dortmund win last term. Winner of the IFFHS World's Best Goalkeeper award for the past four years, 31-year-old Neuer is a true master of the craft, having revolutionised the position since coming through the youth ranks at Dortmund's local rivals Schalke and joining Bayern in 2011. Agile, athletic and a natural shot-stopper, the so-called 'sweeper-keeper' has helped make the Bavarians' defence one of the meanest in Europe, and his natural leadership qualities have seen him take over the captain's armband for both club and country. The Germany No. 1 is currently sidelined with a foot injury, but will be determined to inspire Bayern to more success when he returns in early 2018. Now in his third campaign with Bayern, former Stuttgart favourite Ulreich has been thrust to the fore following Manuel Neuer’s second significant injury setback in the space of five months. A former Germany Under-21 international, the 29-year-old Ulreich has largely delivered in the absence of the national team's custodian, producing several fine stops along the way. "I really hope I can fill Manu’s boots well," Ulreich said, adding, "It’s always a bit different when you know that you’re in the spotlight." At BVB since 2002, the 37-year-old has seen and done it all at the Signal Iduna Park. Weidenfeller may now be back-up to first choice Roman Bürki, but what a presence to have in reserve. With 347 German top-flight games spanning 16 seasons with the Black-Yellows, the former Kaiserslautern custodian is a two-time Bundesliga winner and formed part of the Dortmund side that won a memorable double under coach Jürgen Klopp in 2011-12. Germany’s oldest debutant, Weidenfeller was a member of the 2014 squad that celebrated FIFA World Cup victory in Brazil. Click here for a look at the other ten positions.